VLC is not just a media player. It also works as a useful video editor to merge/cut/rotate videos. And here we will show you how to merge videos in VLC, and also recommend to you a VLC video joiner alternative to merge videos in a much easier and quicker way. I’m sure there is a traffic cone icon on most people’s computer desktop, and that is VLC Media Player. Why VLC is so popular among people? The most important part is that it comes with abundant audio and video decoders, which definitely can play almost all the multi-media files. Although it is well-known for video & audio playback, there are other features that endear itself to many users. It enables you to split videos, convert audio/video files, record screen, download YouTube videos, and even rip DVD. So perhaps you would ask: “Dose VLC merge videos?” Of course! 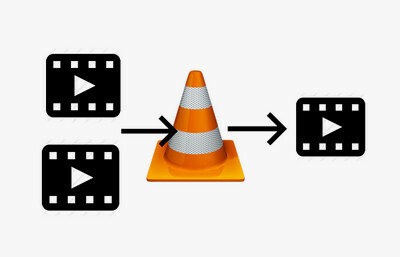 In the following parts, we will give you a step-by-step instruction on how to merge videos in VLC. Free HD Video Converter Factory is an easy-to-use and user-friendly video joiner. Unlike merging videos with VLC, Free HD Video Converter Factory can merge videos even if they are different formats. And after the merging, it allows us to convert the merged one to other desired format, which greatly facilitate us. Step 1. To solve how to merge videos in VLC problem, first, set up a new folder, and put the original video clips into the new folder. Then hold the Shift button and right click the new folder. Next, select Open command window here. Step 2. 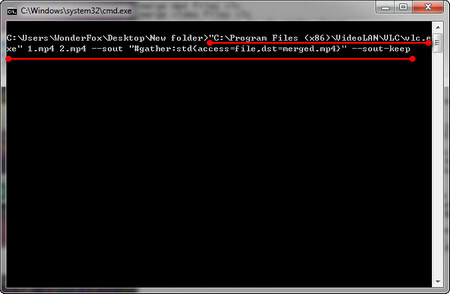 Input the following command to the command window to continue VLC merge videos process. Before inputting the command, you can modify the command appropriately based on the situation, and pay attention to the sequence of the video clips. The number 1 and 2 represent the videos’ names. Before opening the merged videos, make sure VLC is closed, or it will lead to the merging failure or video/audio out of sync problem. Except the above solution on how to merge videos in VLC, there is another way to merge videos. Here, we will share with you a quite easy way to merge multiple videos. Free HD Video Converter Factory is the best alternative for VLC video joiner. Firstly, it is a powerful video converter, supporting over 300 videos and audio formats, keeping you away from the problem of “can’t play the video, because the format is not supported”. Secondly, it is also a video joiner. Compared with VLC, Free HD Video Converter Factory can merge videos even they are different formats. How facilitating it is! Just follow the steps and give it a chance. Before we start the process, just free downloadfree download Free HD Video Converter Factory and install it on our PC. 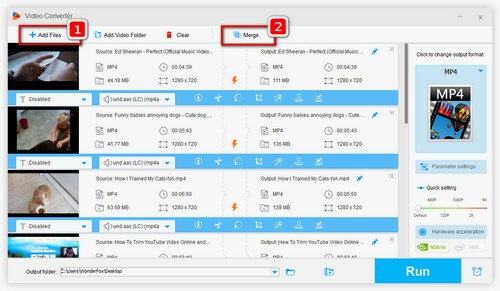 First, launch the easy-to-use video joiner on your computer, then click “Add Files” to add your desired video clips to the program, or you can just drag and drop them to the main interface. Next, click Merge button in the bottom right corner. Press the [+] Merge on the merge window to create pack before selecting video clips, (you’re allowed to create pack 1, pack 2, pack 3……). 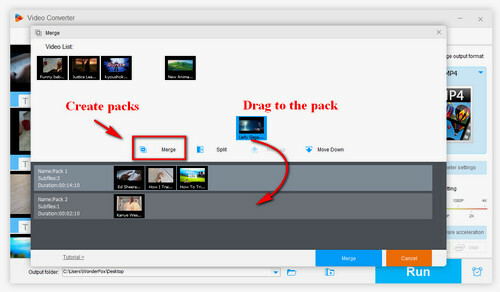 Then drag and drop the video clips from the Original column to the new pack. Also, you can rearrange the video clips orders by dragging. At last, click OK button to continue. This is the best way to merge videos without quality loss. Obviously, compared to solving how to merge videos in VLC, it’s easier to merge videos with Free HD Video Converter Factory. After the 2 steps above, you will see the merged video packs in the main interface. 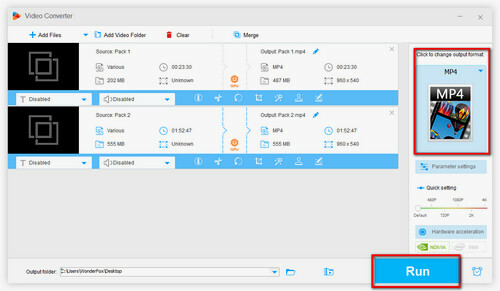 Although you can input video clips with different formats, which is more convenient than VLC merge videos process, you need to choose an output format for the merged videos. Hereto, you can click the Output Format window on the right of the main interface and select your wanted video format under the Video tab. Then, just click RUN button, your merged video will be automatically converted to the proper format. In addition to merge videos, Free HD Video Converter Factory can also merge music without any quality loss to help you enjoy more fun. Do You Want to Convert Merged Videos to Other Formats? In addition to merging videos and audio, Free HD Video Converter Factory is well-known for its powerful converting function. It can convert videos and audio to over 300 formats and devices without any quality loss, and also protect our privacy. Moreover, it provides a downloading function for us. We can easily download lots of great videos and audio from 300+ main video websites. Just free download it and give it a trial. Do you think it’s not convenient to store huge DVD collections and want to make them to digital format? Here, we will introduce to you a brilliant DVD ripper. The DVD Ripper Pro can rip all your DVDs into digital formats with a rather high ripping speed. 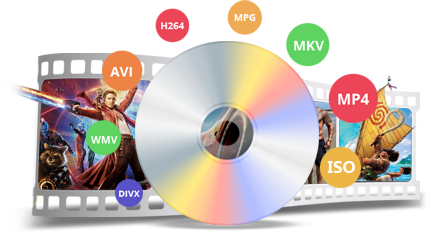 Moreover, if you want to keep your DVD the same as much as possible when ripping to a digital format, DVD Ripper Pro can also help you. It can copy your DVD with flawless 1:1 quality - DVD to ISO image and DVD folder.